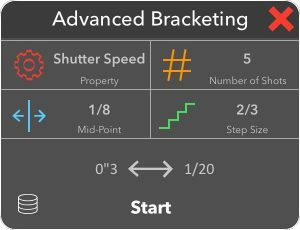 The CamRanger greatly expands the power and flexibility of the camera’s exposure bracketing. Don’t be limited by the camera’s built-in bracketing with limited options for number of shots and exposure step size. The CamRanger automates the process of actually changing the camera’s exposure to remove these limitations. The most and least exposed values will be calculated for the current settings and displayed. I was struggling here to balance the foreground heather and the lovely sky with graduated filters, and the light was fading fast, so I used the HDR function on the CamRanger to capture a series of images at 1 stop increments and then manually blended them together in Photoshop. There are so many things I love about the CamRanger but mostly the ability to control the camera functions, fire the shutter and then quickly review the images and histograms all on a large iPad screen enable me to capture images in changing light conditions. All in all, the CamRanger serves the functionality that I need it to just as I had hoped. It allows me to combine the benefits of having a larger device to check critical focus in the field and control my camera, without the annoyance of carrying a cumbersome laptop around everywhere I go. It’s also a lot less conspicuous. Additionally, it also allows me to quickly review bracketed images to ensure consistency and look out for ghosting problems in the field before I return home and edit them in their full glory. For years I have been waiting for a way to shoot an HDR portrait using strobes. Well, that time is finally here using the CamRanger. This can be achieved using the HDR mode set to ISO. This now gives me a bracketed sequence with three different exposures that can be processed to produce a 32 bit file! I have written a blog on the advantages of 32 bit that might help explain this for those who are interested. Part of the problem with shooting HDR images and moving water, is that you get three different exposure times that produce three different amounts of moment. And when you attempt to blend them into one exposure, it often has a hard time giving you a seamless transition. The beautiful thing about the CamRanger is that you can now bracket your HDR’s images using the ISO. That way your aperture and your shutter speed stay the same throughout the three exposures.